Jill Homer of Juneau, Alaska, is training to ride 350 miles in the human-powered Iditarod. The race, which starts in February, follows the same route used by the famous dog sled teams. 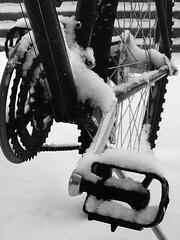 People sometimes say, “Wow, riding a bike on snow – that’s great. But how does it work?” Snow-biking can be different from regular cycling, so I’ve compiled a list of 10 tips for riding a bike on snow. “I predict that not too far in the future, someone will build a bicycle frame with room for motocross tires. Look for it.” It seems odd to me that Jill wouldn’t know about the Surly Pugsley. It seems ideal for the Iditabike, with it’s 4″ (well, 3.7″) tires. I can’t say I know how wide motocross tires are, but I bet 3.7″ is close. Also, for all you commuters looking for winter riding tips, wider tires for flotation is not always best. It works great for deep snow with an uncertain base, but if you know that there is a few inches of snow on top of hardpack or pavement, skinny tires are often a better decision. My cyclocross tires on my hybrid cut right through the snow and bite on the hardpack below. Just watch out for the unseen ice patches!